OdorKlenz Pet Urine Eliminator is ideal for use on carpets and rugs where pet accidents have occurred. The carpeting and flooring in your home often fall victim to pet accidents that need to be tended to quickly. Most urine odor eliminating products are primarily designed to focus on one aspect or chemistry of the urine odor problem, often just masking the urine odor, with perfumes and fragrances but the best way to attack an odor source is to have a product that can work via multiple pathways to achieve odor neutralization. OdorKlenz Pet Urine Eliminator can be used on water-safe surfaces and is designed for use on carpets, fabrics and other extractable surfaces your pet frequents. It destroys odors deep down, eliminating stubborn pet & urine odors at the source. 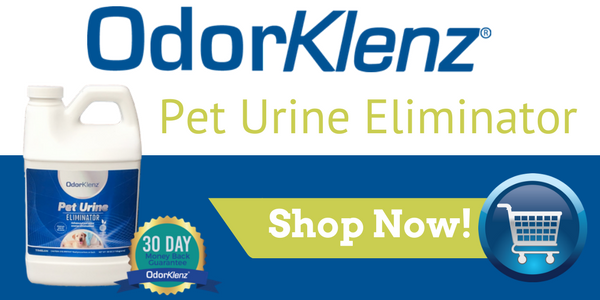 OdorKlenz Pet Urine Eliminator is a specially formulated product to provide maximum neutralization and urine odor extraction by capturing, destroying, and eliminating urine odors safely and effectively. When using the OdorKlenz Pet Urine Eliminator you want to apply it to the surface and work it into the surface of the accident. Allow the product to fully contact the source to ensure the product gets into the surface to eliminate the odor. The steps below are a guide on how to use the OdorKlenz Pet Urine Eliminator. Please read instructions completely before beginning your treatment. Each container is designed to treat approximately 9 square feet of source urine contamination on rugs or carpet. The product can be diluted to treat broad areas with mild or secondary odor contamination. Before each use, vigorously shake for one minute to mix components. Always shake just prior to application to disperse the contents evenly. If the product has frozen, let it thaw completely before use. Only perform the source urine odor elimination on non-delicate surfaces. Do not use on surfaces that cannot be exposed to water. Do not use on areas that are contaminated with other cleaning agents. Clean and remove other products from the treatment area prior to OdorKlenz use. Test OdorKlenz on an inconspicuous area for colorfastness or other surface affects. The OdorKlenz process may leave a white residue that can be removed with repeated brushing, vacuuming, and/or wiping. Do not use in household carpet shampooer. Professional carpet extraction equipment is recommended to remove excess water and residual OdorKlenz for carpets and rugs. 1) Soak up excess urine and any loose debris from the area to be treated with towels or paper towels. 2) Lightly dampen the area to be treated with clean, warm (but not hot) water. 3) Using your vacuum or carpet extractor’s wet extraction capabilities, clean the area 2-3 times to remove as much source urine as possible, leaving the area slightly damp. 4) Pour OdorKlenz on the treatment area to fully contact the source urine. 5) Spread the OdorKlenz into the area working it deeply into the carpet or covering surface completely. Use a comb or your fingers to work OdorKlenz into the fibers of the carpet or rug. 6) Apply pressure with a towel to the area by standing/walking/pushing on the treatment area. 7) Allow the OdorKlenz formulation to remain on the area for 15 minutes. 8) Wet extract the treatment area using clean water. 9) Use additional clean water and agitate between extractions. 10) Repeat the drying and cleanup process 2-3 times to remove any visible residue. 1) Vacuum up loose debris from the area to be treated. 2) Remove other debris by blotting the area with a wet towel. 3) Soak the treatment area with clean, warm water. 4) Rinse the towel and soak up any excess water leaving the area damp. 5) Pour OdorKlenz-S on the prepared area. 6) Spread the OdorKlenz into the area working it deeply into the carpet. 7) Pour fresh, clean water over the OdorKlenz treated area to saturation. 8) Apply pressure to the area by standing/walking on the treated area. 9) Allow the OdorKlenz formulation to remain on the area for 15 minutes. 10) Use your rinsed and clean absorbent towel to soak up any excess water. Repeat 2-3 times to aid drying. 11) Allow the area to completely dry. Note: It may take 24 hours or longer for the area to be completely dry. 12) Once dried, vacuum up the residue. Vacuum until residue has been completely removed by visual examination. 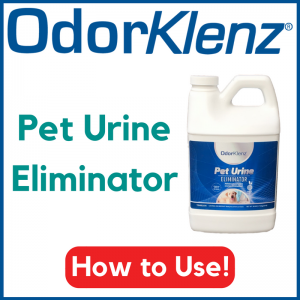 When using the OdorKlenz Pet Urine Eliminator, here are some suggestions and settings to use that encourage the best interaction with the source of the odor and the OdorKlenz Pet Urine Eliminator. Use warm water instead of cold water. Extra clean water rinse at the end to remove visible residue. Allow it to fully dry before making final judgement on overall success. Damp carpets an rugs often have a funny odor. Any other cleaning chemicals such as spot removers in conjuction with the OdorKlenz Pet Urine Eliminator. Do not use in combination with bleach, vinegar, or enzymes. OdorKlenz Pet Urine Eliminator can be diluted and sprayed on subfloors where severely urine damaged carpet and padding has been removed. OdorKlenz Pet Urine Eliminator can be used in the wash with pet blankets and bedding. Use ½ cup per medium or large load with fragrance-free detergent. OdorKlenz Pet Urine Eliminator can be diluted and sprayed onto urine contaminated concrete. In this particular application, the visible residue will be present, so only use in areas where that is not going to be a problem. OdorKlenz Pet Urine Eliminator can be sprayed on to natural pet bedding and left to dry offering some preventative urine odor elimination.